Blue Touch Paper Carnival is about making Carnival accessible. We are working hard to make Carnival for Everyone including you! What's Blue Touch Paper Carnival all about? 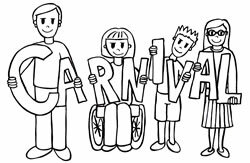 For many disabled people and their family and carers, even something as open as carnival doesn't really work for them. 2012 presented the Blue Touch Paper project and gave an unprecedented opportunity for disabled and deaf people to get out and be seen and heard. Blue Touch Paper was about making a great carnival that was accessible so that everyone can take part. Sarava St George on his dragon! So what happened? What did we do? And how has the BTP project moved on? Blue Touch Paper collaborated with many projects and events to create fantastic carnivals in West Sussex and the Isle of Wight. We have been everywhere and you may have seen us in Horsham's Sparks In The Park event, at One Hackney Festival, in Ryde with The New Carnival Company or even in the Olymipc Park! Photos can be seen here! St George and the gang! Carnival has always been about speaking your mind, expressing yourself and your life and about people coming together. Sharing our lives and the barriers we face is what Blue Touch Paper Carnival was and is all about. We are all different and for some of us carnival can be an uphill struggle! Carnival is about expressing yourself through drumming, dancing, making costumes, storytelling, dj-ing and watching the fun! Have a look through our fab guides to learn about how we put together our carnival the Blue Touch way!